I have to be honest; I’m a new tea drinker. That doesn’t mean I never drank tea, and appreciated it, in the past – quite the contrary. When I was little, my favorite before-bed drink was Celestial Seasonings Sleepytime. I liked the picture of the sleeping bear on the box and was convinced it made me sleep well. We had a handful of other herbal teas around the house. So, yes, I also ventured into raspberry and, as I got older, into Lemon Zinger. (Writing this, I’m getting nostalgic for these and wondering if I can get them here in France). My mom also made herbal iced tea in the summers and let a large jar sit for hours out under the New Mexican sun. I mostly remember hibiscus and SPORTea. We happily drank these at lunchtime. As a teenager, I don’t remember drinking much tea at all and definitely not in college. Here in France pretty much everyone has a hot drink for breakfast (usually coffee, but some prefer tea or chocolate). I’ve gotten in the habit as well, and the days when only orange juice or a smoothie would accompany my cereal seem far away. Back then, it didn’t seem like anything was missing – maybe because I was surrounded by more sun and generally warmer weather. The temperature today in Paris is 6ºC (42º F). Okay, maybe it’s not that cold – yet – but I couldn’t have imagined beginning the day without the comfort of a nice warm drink. My habitual tea drinking slowly began after college, during the two years I spent in Santa Fe before permanently moving to France. That’s where I discovered rooibos (or South African red tea) and honey-sweetened chai. I’d drink these fairly often, alternating between them and a milky latté. Then I moved to France and started drinking earl grey for breakfast. That first year in Bordeaux I didn’t have a coffee machine and heading to work in winter (before the sun rose) required some form of hot caffeinated beverage beforehand. I kept the earl grey up after moving to Paris since we still didn’t have a coffee machine. For a year and a half, Sébastien succumbed to drinking instant coffee, but I had trouble with that one. Why we didn’t go out and buy a simple French press is beyond me. Ode to the innocence of those grad school years! Some time during our second year in Paris, we finally got a coffee machine (that made espressos!) and daily tea drinking went out the window. It wasn’t until about a year or so ago that I started regularly drinking tea again. I’m not exactly sure where or why it started, but little by little the cupboards have piled up with various shapes and sizes of tea boxes, and I have become a full-fledged member of the tea drinking community. That means I now drink tea every day, sometimes more than once. 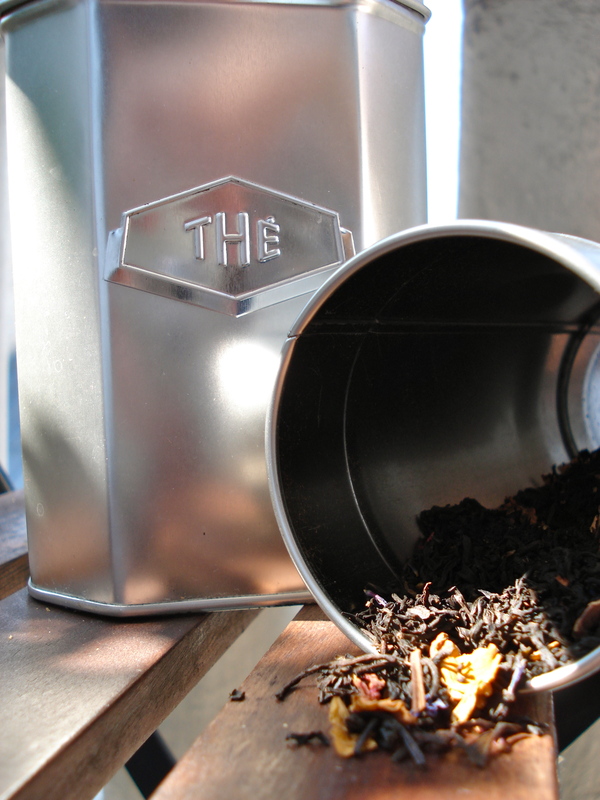 The chai tea from San Francisco that I talked about in this post. Since I’m still relatively new at the whole tea thing, I haven’t explored all the possibilities out there, nor have I discovered all the places around Paris to purchase (or simply sit back and enjoy) tea. My favorite places so far? To purchase, definitely Mariage Frères. To sit down, Bread and Roses Bakery on rue de Fleurus in the 6th. I like their red berry and “Christmas” teas, but I think I really go for the scones served with real whipped cream, jam and Echiré butter. In France, there is thé (black tea) and there are tisanes and infusions (what we call herbal teas). I find that in English I mix it all up and use one word, “tea”. I feel like there is a clear distinction here. If I want caffeine (théine), I’ll get “thé”. If I don’t, I’ll get a “tisane” or a “thé rouge” which naturally doesn’t have caffeine. Ordering herbal tea is easy. Ordering black tea is more complicated because I always like a little milk with it. I’m in heaven each time we go to Britain because I don’t have to ask for it. Not here. Tea is not automatically served with a side of milk. You have to ask – sometimes twice! *Citypharma at 26 rue du Four in the 6th arrondisement has a nice little selection of herbal teas. Actually, they have a nice selection (and the best prices) of just about anything you’ll typically find in a French pharmacy. I could write an entire post on this place. This entry was posted in Everyday Life in Paris, Restaurant Reviews and tagged restaurants, tea. Bookmark the permalink.